SOLD I have four new dolls to introduce to you today. 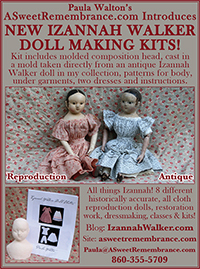 All of them are based on some of Izannah’s earlier dolls. I’m trying something new today! I want you to feel like you have actually come to the studio to visit and enjoy the doll’s birthday party for Izannah, so the descriptions and information about the dolls are on the following videos ❤ I may sound just a bit ditsy and scatterbrained, not to mention out of breath! Please excuse me…. I’ve been sick all week…. don’t worry though I will absolutely sanitize the dolls and their accessories before packing to ship. I’d hate for anyone else to catch my cold! 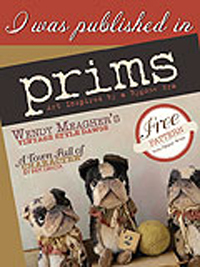 All dolls sold on a first come basis. 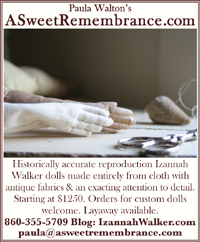 Email me at paula@asweetremembrance.com if you are interested in buying one of these dolls. 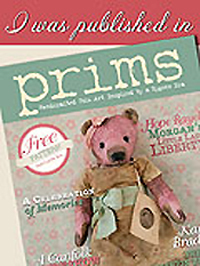 Free shipping within the U.S. exact postage to other countries. 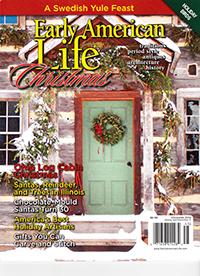 Payment via Paypal, credit card, personal check , plus as always lay-away is an option. 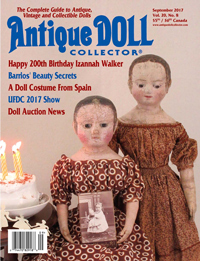 Doll 1 – SOLD 22.5 “Early Izannah” $2225.00 Comes with bare feet, leather shoes, silk stockings, 2 antique petticoats, antique pantalettes, chemise, antique wool jacket + Birthday tote bag. 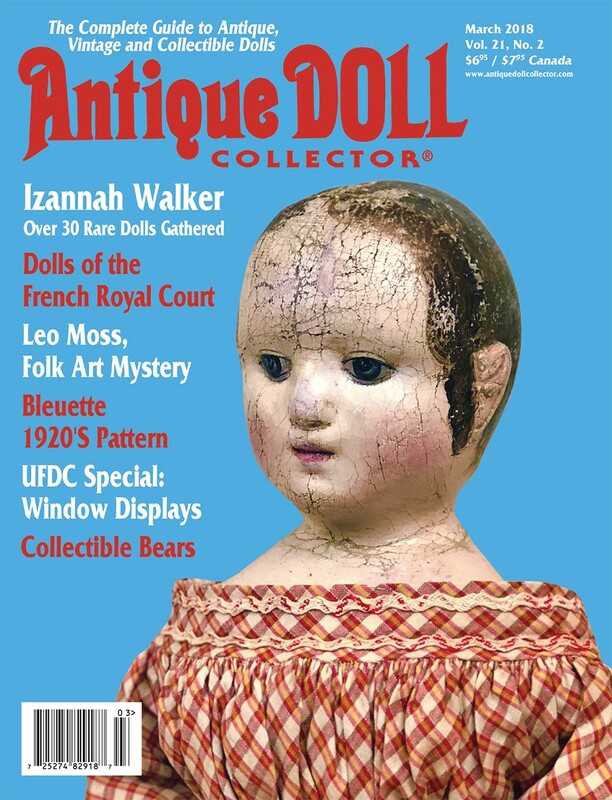 Doll 2 – SOLD 22.5 “Early Izannah” $1925.00 Comes with bare feet, leather shoes, silk stockings, 1 antique dress, 2 antique petticoats, antique pantalettes, chemise + Birthday t-shirt. 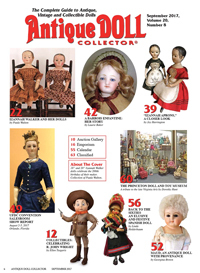 Doll 3 – SOLD “Hannah” $1475.00 Comes with bare feet, leather shoes, silk stockings, antique dress, 1 antique petticoat, antique pantaletts, chemise, pinafore apron + Birthday t-shirt. Doll 4 – SOLD “Hannah” $1375.00 Comes with bare feet, leather shoes, silk stockings, dress, 1 antique petticoat, pantaletts, chemise, + Birthday t-shirt. Antique Doll Trunk for either Doll 1 or Doll 2 – $100.00. Previous Post Video Issues Post 3 – New Dolls Is Going to be Late! Sorry! Hello Paula, All the dolls are looking splendid and i’m not surprised number 1 is already sold. Please take care of yourself, I feel sure you are very busy with this and the Jenny Lind doll club exhibition, just be kind to yourself.